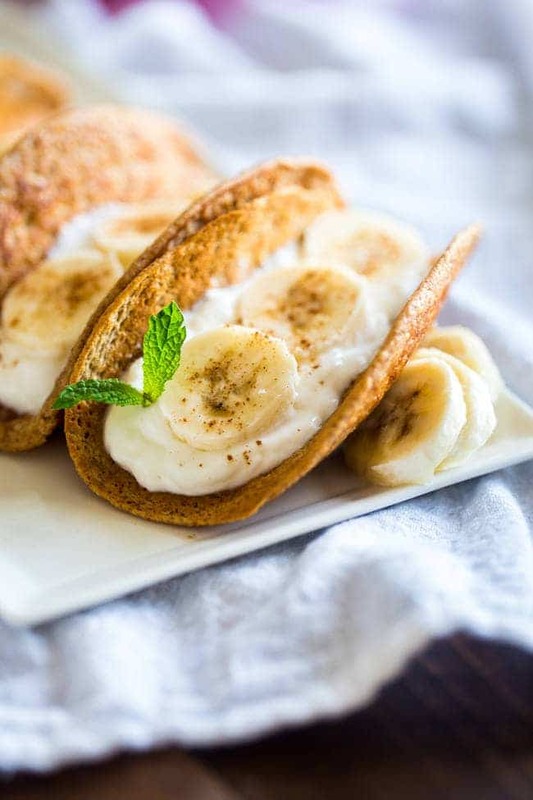 These gluten free banana pancakes are filled with Greek yogurt and rolled up like tacos! They’re a fun, healthy breakfast for only 100 calories per taco! Oh hey you morning-hating person! Guess what? SUPER FUN TIMES AWAIT YOU. !!! Like, super fun times in the form of Greek yogurt protein pancakes that have been TACO-ized, and SHOVED full of MORE smooth, vanilla Greek yogurt (protein HEY YOU!) and sweet, creamy bananas with a tasty sprinkle of spicy cinnamon. I mean, let’s just be rational people here mmkay? Waking up does NOT get better than getting to fill your I-just-woke-up-feed-me-RIGHT-NOW hungry-breakfast mouth with TACOS. But, like. Pancakes. That are TACOS. See folks? Fun times AHEAD. I just noticed I capitalized TACOS about eleventy billion times in the first 2 seconds of this point. Too much? Of course not. 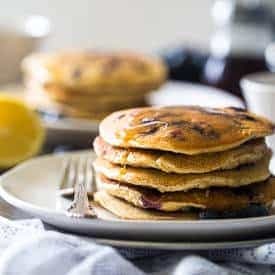 Besides being my newest obsession (you know my <3 <3 <3 x 100 for anything of the pancake variety) these naturally-sweetened stacks of fluffy golden-brown perfection are A-L-S-O for a REALLY good cause! I’m partnering with the American Dairy Association and 10 other bloggers in August to help the American Dairy Association Mideast give gallons of milk to children and families across the country! 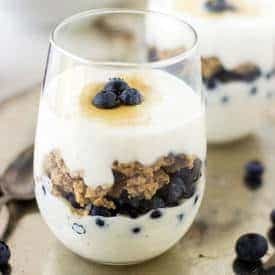 The American Dairy Association Mideast will donate $1 to the Great American Milk Drive for every “like,” comment or share each of the bloggers’ 10 recipes receive on its Facebook page. So, you should probably go and like ALL the photos. Comments are bomb-tastic too. How about a share? You know my thoughts on the important of eating breakfast. And, can I just be super-duper honest with you for a second? I just don’t GET people who don’t eat breakfast. I wake up and preeeeety much contemplate eating my arms off every.single.morning because I don’t know if I can wait the 3 minutes it takes to make my oatmeal. That might (read: is) an exaggeration, but you FEEL ME. Breakfast. Pancakes. I <3 them. I need them. I want them NOW. Maybe even for dinner? JUST EAT THEM ALREADY. Are you ready to have your party just DOWN POURED ON? Let’s do a warning: 3….2….1. It’s almost time to send the kidlets back to land of MATH. Which means you might have to help them solve aforementioned math equations. Honest moment, the sequel, this is the true reason there are no baby FFF’s rollin’ around. The thought of doing any sort of division or multiplication? JUST NO. BUT, if I put myself in mommy hoods imaginary shoes and pretended to have some imaginary little tykes of my own, I would want them to do the best that they possibly could. It’s been show that when kids eat breakfast, they have higher test scores, improved daily attendance PLUSPLUSPLUS better class participation. So, my hypothetical imaginary kids? They be eating ALL the perfectly crisp on the outside-and soft and fluffy on the inside pancakes that are piled HIGH with bananas. What kid doesn’t like banana pancakes? What HUMAN in general doesn’t like banana pancakes? Pancake tacos. Still obsessing. Don’t mind me. Actually do mind me because I want to remind you of my trip with the American Dairy Association Mideast last year, where I FIRST hand got to go back to school (no math involved, DO NOT WORRY) and eat school breakfast with some students. I LOVE that schools here in ‘Merica are doing school breakfast. 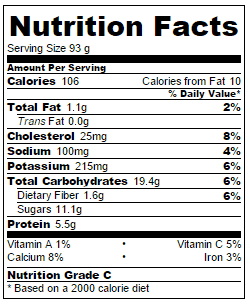 We NEVER had that growing up in Canada, and it ensures a nutritious start to every single day. Oh and guess what we ate at this school breakfast experience? PANCAKES. OBVIIIIIII. ?<— See See SEE! Kids LOVE THEM. IToldYouSo. Especially when they’re fun and have those good-for-you-wholesome-oatmeal vibes. AND, they’re tacos. P.s don’t get any ideas about just making “normal person” pancakes and just putting the Greek yogurt ON TOP. And don’t even THINK about using, dare I say it, a fork and KNIFE. Friends don’t let friends taco with cutlery. 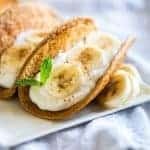 These gluten free banana pancakes are filled with Greek yogurt and rolled up like tacos! They're a fun, healthy breakfast for only 100 calories per taco! Spray a large griddle with cooking spray and heat to 350 degrees, or medium heat. In a large bowl, stir together the oat flour, baking powder, salt and cinnamon. Set aside. In a medium bowl, whisk together the mashed banana, honey, vanilla, egg, milk and Vanilla Greek yogurt until smooth, and only a few lumps from the banana remain. Pour the wet ingredients into the dry ingredient and mix until just combined. 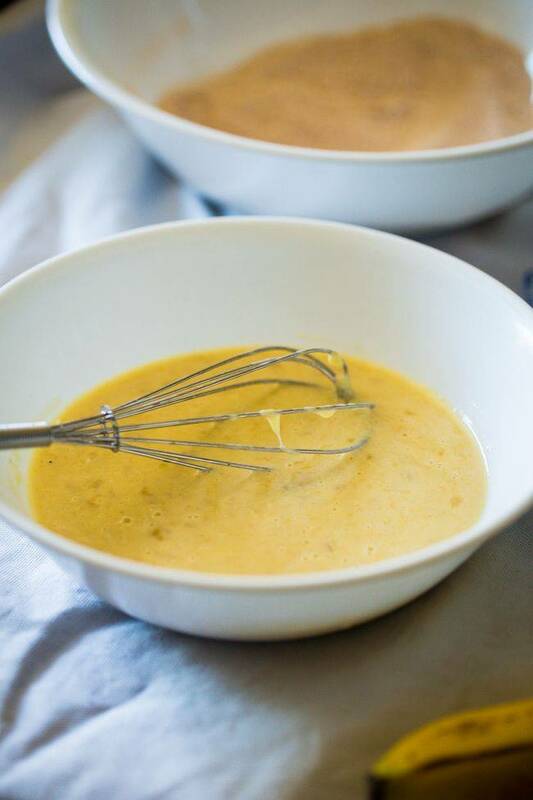 Drop the batter by scant 1/4 cup measurements onto the heated griddle, and quickly spread out thinly with the back of a spoon. These are supposed to be thin and "tortilla-like" not big and puffy. Cook the pancakes until golden brown, about 4-5 minutes. Flip and cook an additional 4-5 minutes. Fill each pancake with about 2 Tbsp of vanilla Greek yogurt, a few slices of banana and a pinch of cinnamon. 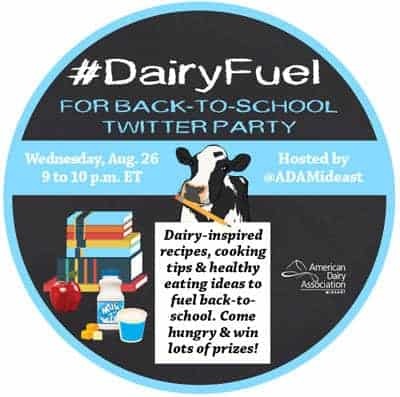 And don’t forget to join us for the super awesome #DairyFuel for Back-To-School Twitter Party on Wednesday, August 26th from 9pm-10pm EST! View the Tweetvite by clicking HERE! Don’t forget to check out the recipes by the other awesome blogger ladies! 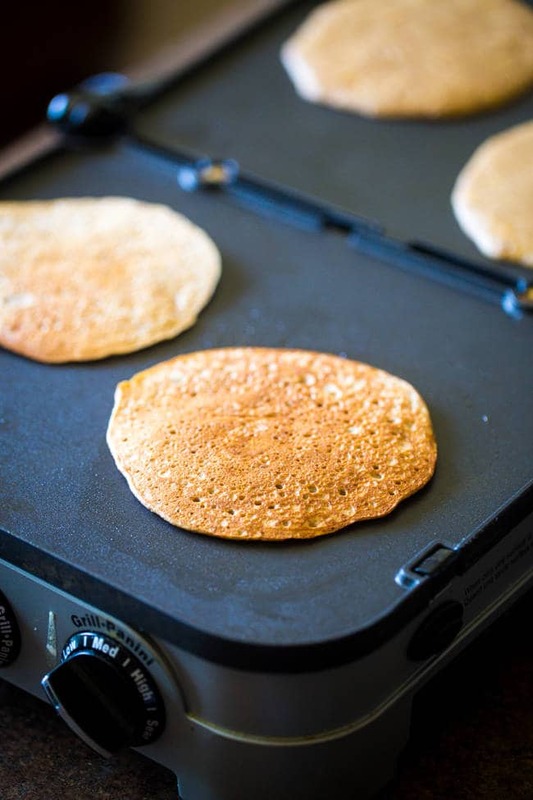 Want more gluten free pancakes? OOOH BEST SUMMER BREAKFAST IDEA EVER! How fun are these pancakes?! Love it, Taylor! 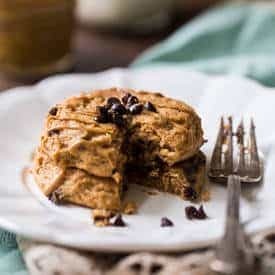 Banana pancakes are one of my favorites and I love the taco style! Pinned! Mine too! You can never go wrong with banana pancakes! Thanks for the love and pin Gayle! Total fun times ahead with these pancakes. LOVE IT! You’re creativity….beyond words. I remember your recap of this last year! You are da sweetest! Thanks Arman..sending virtual pancakes over RIGHT NOW. Any way to eat tacos for breakfast sounds amazing! Yum!! You had me at “banana”, let’s be real. But then seeing TACOS?! Hello, genius. These look insanely fun and delicious. I love “lets be real” because, YES to banana everything! I am so glad it’s not just me! Breakfast sistahs FOR LIFE. Thanks Ashley! I am not a morning person at all. You could call me quite a grumpy morning person, at least until I have my coffee and breakfast, so this is totally my kind of recipe! All that healthy protein makes it perfect! Pinning. Totally feel you on coffee and breakfast! Thanks for the pin Amy! 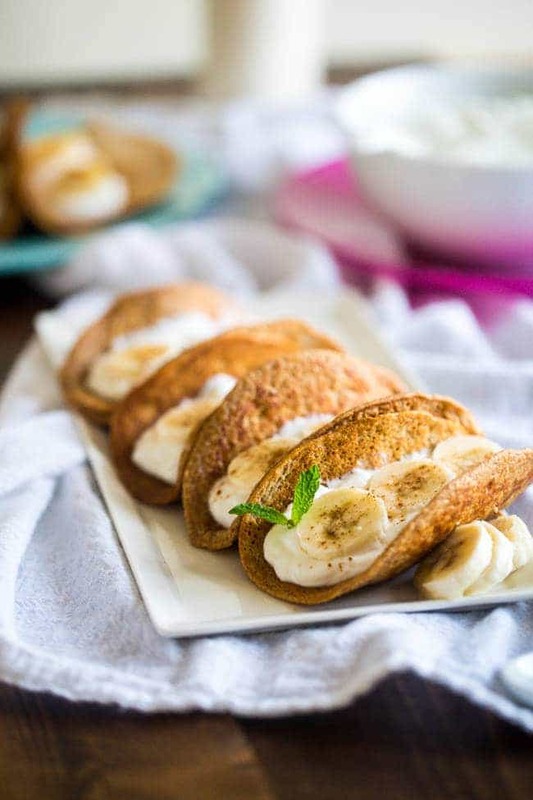 I want these banana pancake tacos TODAY!!!! I wish I could send some! Thanks Aimee! i always ate breakfast as a kid! and so wish i had these then.. or now! haha. Love your creativity and your big heart! I love YOU! Thanks lady! These are so fun! Give me banana everyday for breakfast and visiting the schools…pricelesss. I knew you would agree with me! 🙂 Happy Monday to you too! Thank you! YES! Mine too 🙂 Thanks Chelsea! RIGHT?! They’re SO over-rated! Thanks friend! YES, I knew I loved you for a reason! 😉 Thanks Liz! I love tacos, fun food…AND am a morning person. So I am completely winning at Monday already with these! YEAH YOU AREEEE! Thanks Amy! Tay, I don’t even know where to start with this post (<–Maybe because I haven't had my pancake breakfast yet). First of all, The American Dairy Association Mideast is awesome with their charitable donation of milk! I already liked, commented AND shared this post! 🙂 Now, lets talk about Deeeze Nanner-iffic-Pancakey-taco-tastic creations of NOM! OMG, I LOVE these! The amount of genius going on in your brain NEVER ceases to amaze me! These taco pancakes rock the dang casbah. AND I must have them… like just picture me scouring my house for all da ingredients because that is SOOOOO what I am doing! 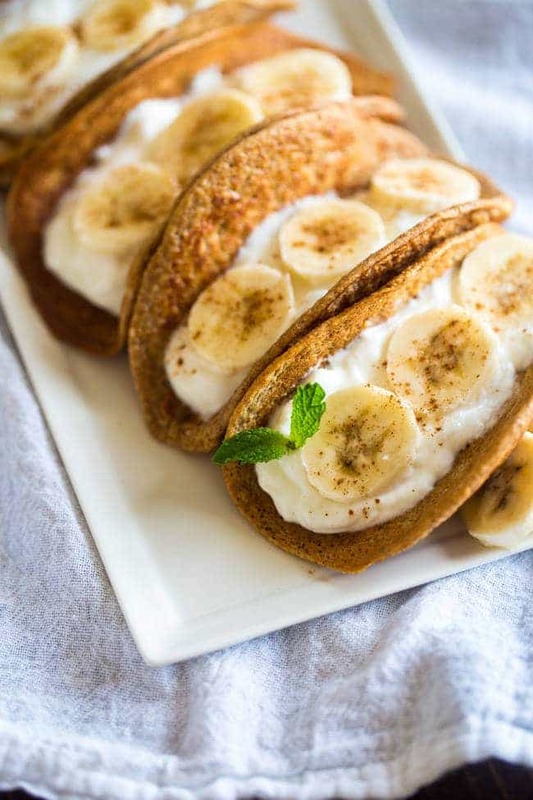 Banana Cinnamon Yogurt Stuffed Taco Pancakes be Callin' my name! Pinned! Cheers, girlie! Thanks for the love girlfriend! Your comments make me SMILE! These are so much fun!! Love the idea of a taco style pancake! Well, I am not a morning person, but I do love banana pancakes. I might roll out of bed earlier to get to this pancake taco!!! I think they would make it worth it! 🙂 Thank you! We can TOTALLY make it a word! 🙂 Thank you! What a totally fun idea! I think my kids would love this (and so would I)! OOOh me likey! I love this twist on breakfast! I think my kids would love this too! I am happy to hear that! Thanks Sheila! Such a great idea! And so much fun. It’s all about fun breakfast-age! Thanks Matt! These are so my kind of breakfast! Totally dig’n this!! This is just such a brilliant idea! My kids would love these for breakfast! Taylor, I freaking love this recipe! what a great idea! pancake tacos!! and love that you went to visit a school and ate breakfast with some students!!! What an awesome idea! I can’t wait to have a taco for breakfast! Heading over now to share some love and get some donations! These pancake tacos are so creative and I love how you made them for such a good cause! Thank you for sharing Laura! It means alot! 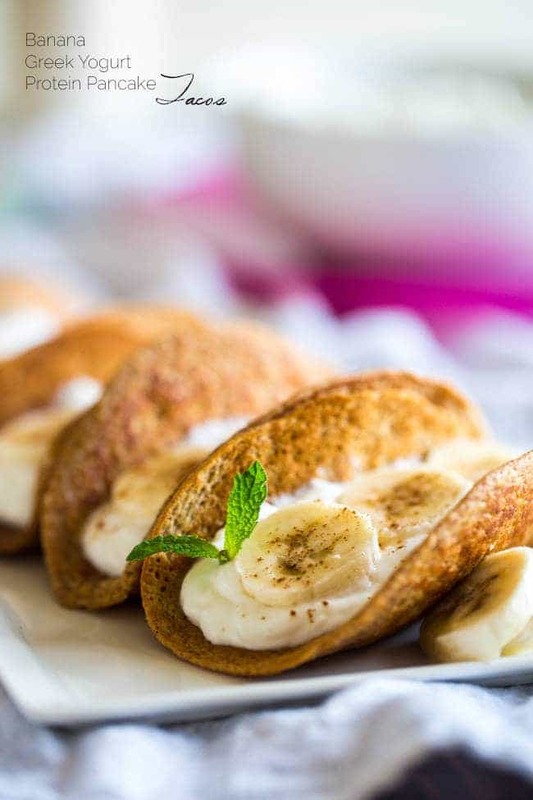 These Banana Pancake TACOS would convince even the sleepiest of heads to jump out of bed! Haha! Glad it was cleared up 😉 Thanks Dani! I absolutely love this! I mean, personally, bananas are a no-go for me. But this recipe is so creative and so much fun for kids and heck the whole family. Just awesome! Too bad about bananas! But definitely great for kiddos! Thanks Jessica! The fun factor of this breakfast is awesome!! These are beautiful! I love the idea for my kids as a snack or breakfast. You pretty much combined our two favorite things: pancakes & tacos! They’re my 2 favs too! Thanks Julia! I can’t believe you found a way to make pancakes even more fun! Wow your future kids are going to be very lucky! Haha, if I have them 😉 Thank you Elle! These are neato burrito!! Neato taco just didn’t rhyme, but you know what I mean!! Totally brilliant!! Bahaha! Love it! Thanks chica! How freakin’ fun are these?! I might, might get out of bed with a smile on my face if I knew these were waiting! Yes! Pancake tacos for breakfast have that effect on people 😉 Thanks lady! This and a GIANT cup of coffee look like the perfect breakfast! Love the idea of pancake tacos, so creative! These look amazing! Once I tried making chocolate breakfast tacos before, but they were flimsy and didn’t stay in place very well. These look great; I am definitely doing to make these. Oh no! These hold up really great I think 🙂 I hope you love them Melanie! Thanks! OMG how cute they are, I just keep scrolling up and down and admiring them, such a fun and creative way to serve pancakes, can’t wait to make these for my boy this weekend! I hope they love them! Thanks for the pancake love Katalina! Anything that gets you out of bed right?! Thanks Johlene! I absolutely love this idea, Taylor! Seriously, you are so creative. Also, anything is better topped with Greek yogurt! These pancakes look absolutely delicious! Thanks so much for sharing your yummy recipe on the Monday Funday Party! You’re so welcome! Thanks Pauline! These are my kinda breakfast tacos! These tacos are just the coolest idea! Thanks for linking up with What’s Cookin’ Wednesday!